Born in Rotterdam in the Netherlands, to Lucy Walter, and her lover, Charles II (who was living in continental exile following his father's execution), James spent his early life in Schiedam. According to biographical research by Hugh Noel Williams (1870–1925), Charles had not arrived at The Hague until the middle of September 1648 – seven months before the child's birth (but he met Lucy for the first time nine months before) — and some unfounded voices whispered that Lucy Walter had in the summer of 1648 been mistress of Colonel Robert Sidney, a younger son of the Earl of Leicester. When the child grew to manhood, contemporaries observed that he bore a strong resemblance to Sidney. The unfounded voices had probably originated from the Duke of York, brother of King Charles II, who was afraid of his nephew's potential claim to the throne. Finally, in 2012, a DNA test conducted on Monmouth's descendant, the 10th Duke of Buccleuch, showed that he shared the same Y chromosome (inherited by son from father) as a distant Stuart cousin, providing strong evidence that Charles II was Monmouth's biological father after all. He had a younger sister Mary Crofts, who may also have been a daughter of Charles, although Theobald Taaffe, 1st Earl of Carlingford is considered another potential father. Mary married the Irishman William Sarsfield and was a sister-in-law of the Jacobite general Patrick Sarsfield. As an illegitimate son, James was not eligible to succeed to the English or Scottish thrones, though there were rumours that Charles and Lucy did marry secretly. Monmouth later himself always claimed his parents were married and that he possessed their marriage lines, but he never produced them. Charles, as King, later testified in writing to his Council that he had never been married to anyone except his queen, Catherine of Braganza. In March 1658, young James was kidnapped by one of the King's men, sent to Paris, and placed in the care of the Crofts baronets, whose surname he took. He briefly attended a school in Familly. On 14 February 1663, at the age of 13, shortly after having been brought to England, James was created Duke of Monmouth, with the subsidiary titles of Earl of Doncaster and Baron Scott of Tynedale, all three in the Peerage of England, and on 28 March 1663 he was appointed a Knight of the Garter. On 20 April 1663, just days after his 14th birthday, he was married to the heiress Anne Scott, 4th Countess of Buccleuch. James took his wife's surname upon marriage. The day after his marriage, the couple were made Duke and Duchess of Buccleuch, Earl and Countess of Dalkeith, and Lord and Lady Scott of Whitchester and Eskdale in the Peerage of Scotland. Monmouth, as he became known, was popular, particularly for his Protestantism, whereas the official heir presumptive to the throne, the King's brother James, Duke of York, had openly converted to Roman Catholicism. In 1665, at the age of 16, Monmouth served in the English fleet under his uncle the Duke of York in the Second Anglo-Dutch War. In June 1666, he returned to England to become captain of a troop of cavalry. On 16 September 1668 he was made colonel of the His Majesty's Own Troop of Horse Guards. He acquired Moor Park in Hertfordshire in April 1670. At the outbreak of the Third Anglo-Dutch War in 1672, a brigade of 6,000 English and Scottish troops was sent to serve as part of the French army (in return for money paid to King Charles), with Monmouth as its commander. He became Lord Lieutenant of the East Riding of Yorkshire and Governor of Kingston-upon-Hull in April 1673. In the campaign of 1673 and in particular at the Siege of Maastricht that June, Monmouth gained a considerable reputation as one of Britain's finest soldiers. He was reported to be replacing Marshal Schomberg as commander of England's Zealand Expedition, but this did not happen. In 1674, Monmouth became Chancellor of Cambridge University and Master of the Horse, and King Charles II directed that all military orders should be brought first to Monmouth for examination, so giving him effective command of the forces; his responsibilities included the movement of troops and the suppression of riots. In March 1677, he also became Lord Lieutenant of Staffordshire. In 1678, Monmouth was commander of the Anglo-Dutch brigade, now fighting for the United Provinces against the French, and he distinguished himself at the Battle of St Denis in August that year during the Franco-Dutch War, further increasing his reputation. The following year, after his return to Britain, he commanded the small army raised to put down the rebellion of the Scottish Covenanters and despite being heavily outnumbered, he decisively defeated the (admittedly poorly equipped) Covenanter rebels at the Battle of Bothwell Bridge on 22 June 1679. It was at about this time that he was first seriously proposed as the rightful heir to the Crown, despite the obvious problem of his illegitimacy, and his father's refusal to acknowledge that he had married Lucy Walter. Monmouth may have come to sincerely believe that his parents had been married. As his popularity with the masses increased, Monmouth was obliged to go into exile in the Dutch United Provinces in September 1679. Following the discovery of the so-called Rye House Plot in 1683, which aimed to assassinate both Charles II and his brother James, Monmouth, who had been encouraged by his supporters to assert his right to the throne, was identified as a conspirator. On King Charles II's death in February 1685, Monmouth led the Monmouth Rebellion, landing with three ships at Lyme Regis in Dorset in early June 1685 in an attempt to take the throne from his uncle. He published a "Declaration for the defence and vindication of the protestant religion and of the laws, rights and priviledges of England from the invasion made upon them, and for delivering the Kingdom from the usurpation and tyranny of us by the name of James, Duke of York": King James II and VII responded by issuing an order for the publishers and distributors of the paper to be arrested. Monmouth declared himself King at various places along the route including Axminster, Chard, Ilminster and Taunton. The two armies met at the Battle of Sedgemoor on 6 July 1685, the last clear-cut pitched battle on open ground between two military forces fought on English soil: Monmouth's makeshift force could not compete with the regular army, and was soundly defeated. On 8 July 1685, Monmouth was captured and arrested near Ringwood in Hampshire,  by tradition "in a field of peas". The events surrounding his capture are recorded in detail in Tait's Edinburgh Magazine. Following the battle a reward of £5,000 was offered for his capture. "Upon the 7th, about five in the morning, some of the Lord Lumley's said scouts riding in the road near Holt Lodge in Dorset, four miles west of Ringwood in Hampshire, just at the turn of a cross way, surprised and seized two suspected persons, which, when the Lord Lumley came up, proved to be Lord Grey and Hollyday the guide. Lord Lumley now commenced a strict examination of the cottages scattered thickly over this heathy country, and called those to assist him who were acquainted with the locality. Sir William Portman was informed of the capture that had been made, and hastened to the spot, with as many of his horse and foot as he could suddenly get together. As Lord Lumley was making inquiries of the cottagers, a poor woman, Amy Farrant, directed him to a hedge, over which she had seen two men go. This hedge proved to be part of the outbounds of several enclosed fields, some overgrown with fern and brakes, and others sown with rye, peas, and oats. The assembled militia were placed around these outbounds, at short distances from each other, while horse and foot performed their assigned duty — that of beating about within". When the Duke had left his horse at Woodyates Inn, he exchanged clothes with a shepherd, who was soon discovered by local loyalists and interrogated. Dogs were then put onto the Duke's scent. Monmouth dropped his gold snuff-box, full of gold pieces, in a pea-field, where it was afterwards found. From Woodyates Inn the Duke had gone to Shag's Heath, in the middle of which was a cluster of small farms, called the "Island". Amy Farrant gave information that the fugitives were concealed within the Island. The Duke, accompanied by Busse and Brandenburgher, remained concealed all day, with soldiers surrounding the area and threatening to set fire to the woodland. Brandenburgher deserted him at 1 am, and was later captured and interrogated, and is believed to have given away the Duke's hiding place. The spot was at the north-eastern extremity of the Island, now known as Monmouth's Close, in the manor of Woodlands, the property of the Earl of Shaftesbury. At about 7 am Henry Parkin, a militia-soldier and servant of Samuel Rolle, discovered the brown skirt of Monmouth's coat as he lay hidden in a ditch covered with fern and brambles under an ash tree, and called for help. The Duke was seized. Bystanders shouted out "Shoot him! shoot him! ", but Sir William Portman happening to be near the spot, immediately rode up, and laid hands on him as his prisoner. Amy Farrant's family are known to have languished in decay and poverty ever afterwards. Monmouth was then "in the last extremity of hunger and fatigue, with no sustenance but a few raw peas in his pocket. He could not stand, and his appearance was much changed. Since landing in England, the Duke had not had a good night's rest, or eaten one meal in quiet, being perpetually agitated with the cares that attend unfortunate ambition". He had "received no other sustenance than the brook and the field afforded". The Duke was taken to Holt Lodge, in the parish of Wimborne, about a mile away, the residence of Anthony Etterick, a magistrate who asked the Duke what he would do if released, to which he answered "that if his horse and arms were but restored to him at the same time, he needed only to ride through the army; and he defied them to take him again". The magistrate ordered him taken to London. Following his capture, Parliament passed an Act of Attainder, 1 Ja. II c. 2. The King took the unusual step of allowing his nephew an audience, despite having no intention of extending a pardon to him, thus breaking with a longstanding tradition that the King should only give an audience when he intended to show clemency. The prisoner unsuccessfully implored his mercy, and even offered to convert to Catholicism, but to no avail. The King, disgusted by his abject behaviour, coldly told him to prepare to die, and later remarked that Monmouth "did not behave as well as I expected". Numerous pleas for mercy were addressed to the King, but he ignored them all, even that of his sister-in-law, the Dowager Queen Catherine. Monmouth was beheaded by Jack Ketch on 15 July 1685, on Tower Hill. Shortly beforehand, Bishops Turner of Ely and Ken of Bath and Wells visited the Duke to prepare him for eternity, but withheld the Eucharist, for the condemned man refused to acknowledge that either his rebellion or his relationship with Lady Wentworth had been sinful. It is said that before laying his head to the block, Monmouth specifically bade Ketch finish him at one blow, saying he had mauled others before. Disconcerted, Ketch did indeed inflict multiple blows with his axe, the prisoner rising up reproachfully the while – a ghastly sight that shocked the witnesses, drawing forth execrations and groans. Some say a knife was at last employed to sever the head from the twitching body. Sources vary; some claim eight blows, the official Tower of London fact sheet says it took five blows, while Charles Spencer, in his book Blenheim, puts it at seven. Monmouth was buried in the Church of St Peter ad Vincula in the Tower of London. His Dukedom of Monmouth was forfeited, but the subsidiary titles of that dukedom (Earl of Doncaster and Baron Scott of Tindale) were restored to his grandson, Francis Scott, 2nd Duke of Buccleuch (1695–1751), on 23 March 1743. According to legend, a portrait was painted of Monmouth after his execution: the tradition states that it was realised after the execution that there was no official portrait of the Duke – so his body was exhumed, the head stitched back on the body, and it was sat for its portrait to be painted. However, there are at least two formal portraits of Monmouth tentatively dated to before his death currently in the National Portrait Gallery in London, and another painting once identified with Monmouth that shows a sleeping or dead man that could have given rise to the story. One of the many theories about the identity of The Man in the Iron Mask is that he was Monmouth: this seems to be based on the unlikely reasoning that James II would not execute his own nephew, so someone else was executed, and James II arranged for Monmouth to be taken to France and put in the custody of his cousin Louis XIV of France. And I eat and drink with a king." But your mother was but a turd." But his mother we knew a whore". Coat of Arms of the 1st Duke of Monmouth and Buccleuch: The royal arms of King Charles II differenced with a baton sinister argent overall an inescutcheon of pretence of Scott (Or, on a bend azure a mullet of six points between two crescents of the field). James Scott, Earl of Dalkeith (23 May 1674 – 14 March 1705). He was married on 2 January 1693/1694 to Henrietta Hyde, daughter of Laurence Hyde, 1st Earl of Rochester. They were parents to Francis Scott, 2nd Duke of Buccleuch. James Crofts (died March 1732), major-general in the Army. Henrietta Crofts (c. 1682 – 27 February 1730). She was married around 1697 to Charles Paulet, 2nd Duke of Bolton. Toward the end of his life he conducted an affair with Henrietta, Baroness Wentworth. ^ "Scotland's DNA: Descended from lost tribes…and related to Napoleon". The Scotsman. 17 April 2012. Retrieved 20 April 2012. ^ Harrison, Bruce (2005). "The Family Forest Descendants of Lady Joan Beaufort". Milisecond Publishing. p. 532. Retrieved 15 October 2015. ^ "Lucy Walter". Welsh Biography Online. Retrieved 13 May 2012. ^ a b "Scott, James Crofts, Duke of Monmouth". University of Hull. Retrieved 13 May 2012. ^ "Setting the Scene in Wessex: the 17th Century in Literature and Drama". Retrieved 13 May 2012. ^ Brydges, Sir Egerton (1812). Collins's Peerage of England; Genealogical, Biographical and Historical. 3. F.C. and J. Rivington. p. 511. ^ a b c d Burke, Bernard (1914). Genealogical and Heraldic Dictionary of the Peerage and Baronetage of the British Empire. London: Burke's Peerage Limited. p. 320. ^ "Moor Park". Archived from the original on 12 December 2013. Retrieved 19 April 2012. ^ "Monmouth, James, Duke of Monmouth (MNMT663J)". A Cambridge Alumni Database. University of Cambridge. ^ "No. 1328". The London Gazette. 8 August 1678. p. 1. ^ Flantzer, Susan. "James Scott, 1st Duke of Monmouth, illegitimate son of King Charles II of England". Unofficial Royalty. Retrieved 22 March 2017. ^ "No. 1848". The London Gazette. 2 August 1683. p. 2. ^ "No. 2042". The London Gazette. 11 June 1685. p. 1. ^ "No. 2043". The London Gazette. 15 June 1685. p. 1. ^ "King Crowned in Chard". Chard Tourist Guide. 26 June 2005. Retrieved 13 May 2012. ^ "No. 2049". The London Gazette. 6 July 1685. p. 1. ^ "No. 2050". The London Gazette. 9 July 1685. p. 1. ^ "Whereas James Duke of Monmouth has in an hostile manner Invaded this Kingdome and is now in open Rebellion Levying War against the King contrary to the Duty of his Allegiance, Be it enacted ... That the said James Duke of Monmouth Stand and be Convicted and Attainted of High-Treason and that he suffer Paines of Death and Incurr all Forfeitures as a Traitor Convicted and Attainted of High Treason." The Statutes of the Realm, vol. VI (1819). ^ "No. 2051". The London Gazette. 13 July 1685. p. 2. ^ "Tower of London: Fact sheet" (PDF). Archived from the original (PDF) on 27 March 2009. Retrieved 10 October 2009. ^ Spencer, p.54: "Monmouth had a particularly grisly end, the executioner's axe striking seven times before his head severed"
^ "The Chapel of St. Peter ad Vincula and Tower Green". English Monarchs. Retrieved 24 September 2017. ^ "Earl of Doncaster". Retrieved 19 May 2012. ^ ""The People's Almanac" series of books cites this story". Trivia-library.com. Retrieved 13 May 2012. ^ "National Portrait Gallery NPG 151". Npg.org.uk. Retrieved 13 May 2012. ^ "National Portrait Gallery NPG 1566". Npg.org.uk. Retrieved 13 May 2012. ^ Shaw, Samuel, "Duke of Monmouth: Man in the Iron Mask" in Oxford Journals (Oxford, 1870) Vol s4-V, No 120. ^ "Henry Purcell: Duets, Dialogues and Trios, edited by Ian Spink (Purcell Society Edition Vol. 22B)". Purcell Society. Retrieved 4 December 2016. Beatty, Michael (2003). The English Royal Family of America, from Jamestown to the American Revolution. McFarland and co. ISBN 0-7864-1558-4. Macaulay, Thomas Babington (1878). The History of England from the Accession of James II, Volume I. J. B. Lippincott & Co., Philadelphia. Raithby, John (1819). James the Second, 1685: An Act to Attaint James Duke of Monmouth of High-Treason. (Chapter II. Rot. Parl. nu. 2. ), Statutes of the Realm: volume 6: 1685–94. Retrieved 13 May 2012. Roberts, George (1844). Life, progresses and rebellion of James, Duke of Monmouth to his capture and execution. Longmans, Brown, Green and Longmans. Spencer, 9th Earl Spencer, Charles (2005). Blenheim, Chapter 3: John Churchill. Phoenix. ISBN 978-0304367047. Watson, J.N.P. Captain General and Rebel Chief: The Life of James, Duke of Monmouth. George Allen & Unwin, 1979. Williams, Hugh Noel (1915). Rival sultanas. Hutchinson & Co.
Wikisource has the text of the 1885–1900 Dictionary of National Biography's article about Scott, James (1649-1685). "Monmouth, James, Duke of". The Nuttall Encyclopædia. 1907. Wyndham, Violet (1976). Protestant Duke: Life of the Duke of Monmouth. Littlehampton Book Services. ISBN 0-297-77099-3. James, the son of Charles II. by Lucy Walter, daughter of William Walter, of Roch Castle, co. Pembroke. He was born April 9th, 1649, and landed in England with the Queen-Mother, July 28th, 1662, when he bore the name of Crofts, after Lord Crofts, his governor. He was created Duke of Monmouth, February 14th, 1663, and married Lady Anne Scott, daughter and heiress of Francis, second Earl of Buccleuch, on April 20th following. In 1673 he took the name of Scott, and was created Duke of Buccleuch. I checked other authorities to see if there was an error in the dates, but the entry is correct. James, duke of Monmouth, was a natural son of Charles II. by Mrs. Lucy Walters, daughter of Richard Walters, of Haverford West, in the county of Pembroke. Courage and good nature, youth and beauty, ambition and pliancy of temper, contributed to render him the favourite of his father, the minion of the people, and the tool of faction. Accumulated wealth and honour, universal popularity and royal favour, though more than he could well bear, did not satisfy him. He knew not how to be happy without sovereignty, while he enjoyed all its advantages, without any of its cares. He even pretended that he had a right to the succession; and it is certain that the king for some time connived at his ambition, as he thought his faction a proper counter-balance to that of the duke of York. The earl of Shaftesbury, who managed him as he thought fit, first formed the project of raising him to the throne. [T]he son of Charles II. by Lucy Waters, daughter of Richard Waters, of Haverfordwest, who bore the name of Crofts till he was created Duke of Monmouth in 1662, previously to his marriage with Lady Anne Scott, daughter to Francis, Earl of Buccleuch; from which match the present Duke of Buccleuch descends. 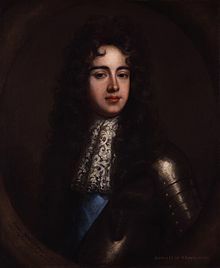 SCOTT, JAMES (known as Fitzroy and as Crofts), Duke of Monmouth And Buccleuch (1649-1685), natural son of Charles II, by Lucy, daughter of Richard Walters of Haverfordwest; born at the Hague; entrusted on his mother's death to the care of Lord Crofts, as whose kinsman he passed; instructed in protestant religion; acknowledged by Charles II as his son, 1663, and made Baron Tyndale, Earl of Doncaster, Duke of Monmouth, and K.G. ; married Anne Scott, countess of Buccleuch, and took surname of Scott, 1663; captain of Charles II’s lifeguard of horse, 1668; privy councillor, 1670; captain-general of Charles II's forces, 1670; served against Dutch, 1672 and 1673; chancellor of Cambridge University, 1674; served against the French at Ostend and Mons, 1678; identified himself with protestant movement in England; quelled insurrection which ensued in Scotland on murder of Archbishop Sharp, 1679; deprived of commission as general, in consequence of reaction in favour of Duke of York, and banished, 1679; retired to Holland, but returned immediately and was deprived of all offices; deprived of chancellorship of Cambridge, 1682; made progress through west of England, and was arrested at Taunton, but released on bail; joined Russell, Essex, and Sidney in plot to murder Charles II and Duke of York; in conjunction with Essex, Howard, Russell, Hampden, and Sidney arranged for risings in England and Scotland; was promised pardon, having revealed to Charles II all he knew of the conspiracy after its discovery, but was banished from the court; retired to Zealand, 1684; treated with marked respect by Prince of Orange, who, however, dismissed him on death of Charles II; arranged with Argyll and Ferguson expedition to England; landed at Lyme Regis, 11 June 1685, and claimed as 'head and captain-general of protestant forces of the kingdom' a ‘legitimate and legal' right to the crown; was proclaimed king at Taunton, 20 June; defeated by Feversham and Churchill at Sedgemoor, 5 July; escaped, but was captured; executed in the Tower of London, 15 July. Portraits of him by Lely and W. Wissing are in the National Portrait Gallery. James Crofts was created Duke of Monmouth on 14 February 1663, at the age of 14, shortly after having been brought to England, with the subsidiary titles of Earl of Doncaster and Baron Scott of Tynedale, all three in the Peerage of England, and on 28 March 1663 he was appointed a Knight of the Garter. On 20 April 1663, Sir James Crofts, Duke of Monmouth was married to the heiress Anne Scott, 4th Countess of Buccleuch, at which time he took the last name of Scott. SP referred to Crofts in October and Monmouth in November and December, 1662. I infer that the title was announced a few months before it was actually conferred. 1649-1685. An English nobleman who was executed in 1685 after making an unsuccessful attempt to claim the British throne, the Monmouth Rebellion. He was born in Rotterdam in the Netherlands, the illegitimate son of Charles II and his mistress, Lucy Walter, who had followed him into continental exile after the execution of Charles II's father, King Charles I.